Over the last two decades, traditional formulations of the idea of atonement have come under heavy attack from feminist theologians and others. They argue that the traditional view valorizes suffering and encourages people to acquiesce in needless self-sacrificing, that it is unseemly to think of God as demanding suffering of his son, and that the theology of the cross needs to be rethought in light of the whole life, ministry, and resurrection of Jesus. Equally committed to the insights of the theology of the cross and feminist theology, Deanna Thompson takes up these contentious issues here in a creative and nuanced way. Her work emerges from direct engagement with Martin Luther and the Heidelberg Disputation as well as with the architects of reformist feminism. She finds surprising common ground on issues of suffering, abuse, atonement, reform, ethics, and the import of Jesus, and her book culminates in a constructive and promising feminist theology of the cross. The cross alone is our theology. No one was saved by the execution of Jesus. Participants in Christian community cannot avoid the bloodied body of Jesus hanging from a cross. But what significance does the cross have for Christians today? Contemporary theology plays host to a chorus of voices calling for an accounting of the church’s long history of using the cross of Christ to inflict suffering upon the innocent. From blaming the Jews for Jesus’s death to the Crusades to invoking the cross as justification for the silent suffering of women, Christianity must confront the ways in which its theology and practices glorify and even cause undeserved suffering. Among the alleged perpetrators littering the historical Christian landscape, few loom as large as the reformers of sixteenth-century Europe, those fathers of Protestantism obsessed with God’s harsh wrath and judgment on deservedly damned human beings. Indeed, we need not wade far into the writings of reformer Martin Luther before we become submerged in what author Kathleen Norris calls the “scary vocabulary” of Christian speech. When heard with twenty-first century ears, much of what Luther says and how he says it offends modern sensibilities: that the sinner must be slain by the cross of Christ, that to be a Christian is to have to suffer, that a sinner must be humiliated by God in order to be made righteous. Does speaking rightly about God today demand that we abandon the theologizing of bygone thinkers like Luther? 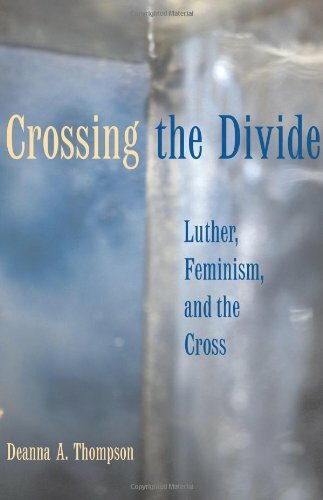 Feminist and other contemporary theologians proclaim that speaking rightly of God requires radical reform of traditional theologies like Luther’s. That theology is contextual has become a central claim in current theological parlance, and Luther’s own admonitions on wrath, sin, and guilt add real insult to real injury when to those whose lives bear the marks of real crucifixions. Even more pointedly, traditional theories of atonement and theologies of the cross have come under attack by feminists and others who work to unmask these theologies’ damage to the wounded, the vulnerable, and the oppressed. Where is the good news preached to the victimized? The responsibility for such oppression and suffering is being laid at the feet of traditional Christian patriarchy, of which Luther is a card-carrying member. Cries for reform rise up, and they deserve a hearing.